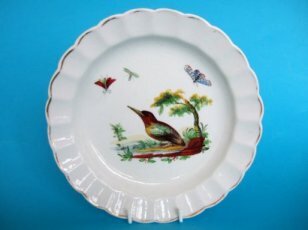 An attractive mid 19th.Century Davenport bone china dessert plate. Very skillfully painted to the centre with a 'Picturesque' view. 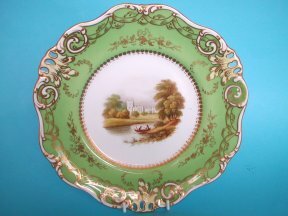 The pierced rim with attractive moulding and high quality gilding work. Measures 23.5cm. diameter. There is an underglaze blue factory mark, painters marks and pattern number 1103. Quite good, just a small area a re-toughing to the rim at 3.o'clock. Arrowed in first picture. A bone china Armorial plate, possibly made at Chamberlain Worcester. The centre with Armorial crest and motto 'Noli Me Tangere' ( Touch me not ). I am a present researching for whom the service was made. No factory Marks. The lable on the back is an old price ticket for 3 Guineas! The plate measures 26cm. diameter. No damage. A little wear to the gilding. Crazing to the glaze and some staining that could almost certainly be removed. A Rare Chelsea Derby Porcelain Plate. 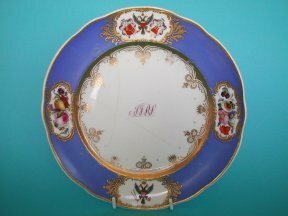 A rare English porcelain plate dating from the 1770's. Probably made at Derby in the Chelsea Derby period. Shaped with a twenty-four lobed rim The centre printed and hand coloured with a Kingfisher type bird and insects in a landscape. Measures 20.2cm. (7.99 inches) diameter. There is some speckling to the glaze from the firing. There is typical crazing to the glaze. There is wear to the rim gilding. Also a small chip/indent to the footrim which looks like someone has tried the old 'file test' (hard or soft paste) on the footrim. 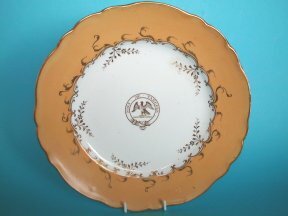 An interesting Davenport Armorial dessert plate. Decorated with high quality enameling and raised gilding with two coats of arms and a central monogram. Probably from a marriage service. c.1830. The plate measures 20.7cm. diameter. Marked, Davenport Longport Staffordshire.